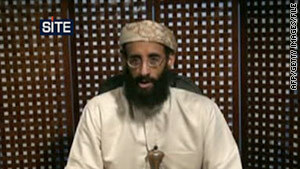 U.S. authorities think Anwar al-Awlaki inspired at least two acts of terrorism aimed at Americans. Washington (CNN) -- A judge threw a "unique and extraordinary" lawsuit out of court Tuesday, leaving open the question of whether the U.S. government can legally target American citizens for death abroad without a trial. The father of suspected terrorist leader Anwar al-Awlaki sued President Barack Obama, Defense Secretary Robert Gates and CIA Director Leon Panetta to prevent them from having his son killed in a drone strike. U.S. District Court Judge John Bates dismissed the case on procedural grounds, saying that Nasser al-Awlaki did not have standing to sue and that the officials were immune from such lawsuits anyway. In an 83-page opinion, Bates declared that it was up to the elected branches of government, not the courts, to determine whether the United States has the authority. Anwar al-Awlaki is believed by U.S. authorities to have inspired acts of terrorism aimed at the United States, including a fatal shooting at Fort Hood, Texas, and the December 25 bombing attempt to bring down an airliner flying to Detroit, Michigan. Bates said the case raised "stark and perplexing questions," such as why the government needed court permission to wiretap Americans abroad but not, apparently, to kill them. He also asked why a citizen calling for "jihad against the West" and planning terror attacks could use the courts to defend his constitutional rights. Unfortunately, Bates concluded, "no matter how interesting and no matter how important this case may be ... we cannot address it unless we have jurisdiction." The American Civil Liberties Union, which backed the suit, called the outcome inconsistent with the Constitution and dangerous to American liberty. "If the court's ruling is correct, the government has unreviewable authority to carry out the targeted killing of any American, anywhere, whom the president deems to be a threat to the nation," the ACLU's Jameel Jaffer said in a statement. Jaffer was one of the lawyers on the case. The judge's argument that the question at the heart of the case was political, not legal, disturbed another of the attorneys, Pardiss Kebriaei of the Center for Constitutional Rights. "The court's holding on the political question doctrine is indeed 'unsettling,' " Kebriaei said in a statement, borrowing the language of the ruling.